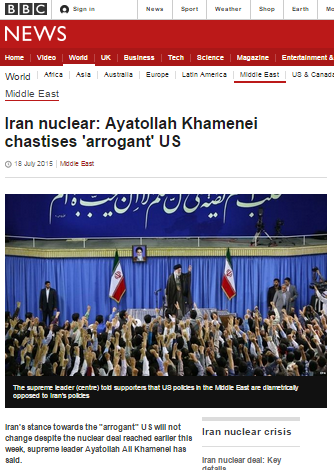 An article which appeared on the BBC News website’s Middle East page on July 18th with the headline “Iran nuclear: Ayatollah Khamenei chastises ‘arrogant’ US” purported to summarise in its 319 words a speech made by Khamenei on the same day. However, in the BBC’s account of the speech readers are told four times that Khamenei used the words ‘deal’ or ‘agreement’. In other words, the BBC has censored Khamenei’s pledge of support for the Syrian regime and for terrorist organisations including Hizballah, Hamas and the Palestinian Islamic Jihad. “The supreme leader also denied that Iran was intending to create a nuclear bomb. “The Americans say they stopped Iran from acquiring a nuclear weapon,” he said in his speech at the Mosala mosque in Tehran. “Another point is about the Americans’ blustering in recent days. In the recent days that the negotiations have been concluded, the American excellencies – their male and female officials – are busy blustering. Each of them is blustering in a different way. Of course, this is alright with us. Their domestic problems force them into blustering. They claim that they have dragged Iran towards the negotiating table, that they have made Iran surrender, that they have obtained such and such concessions from our country and other such claims. However, the truth is something else. They say that they have prevented Iran from building nuclear weapons, but this has nothing to do with our negotiations with America and other countries. They themselves know this and sometimes they have spoken about the importance of the fatwa that bans nuclear weapons. As has been the case in the past, the controversy surrounding the topic of that apparently unwritten fatwa is not clarified to BBC audiences and as has been noted here before, readers may find this essay by a former BBC Persian analyst helpful in understanding the significance – or lack of it – of such a fatwa. As we see, the version of Khamenei’s speech presented to Western audiences by the BBC replaces the word ‘document’ with ‘deal’ or ‘agreement’. It also censors the Iranian regime’s expression of continued support for terrorism and, of course, its anti-Israel content. BBC audiences trying to understand the significance and implications of the JCPOA signed between the P5+1 and Iran would obviously have found that information beneficial to their understanding of the reservations raised by many parties in relation to the likely effects of sanctions relief on Iran’s patronage of terrorist groups in the Middle East and beyond. The BBC, however, chose to censor that information. I am wondering why Pakistan has Nuclear weapons? If it is forbidden, then Pakistan are violatin Islam. IT sound more like the Islamic tradition of taqiyya.